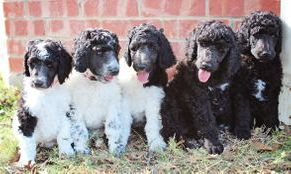 We own and raise dual registered AKC and UKC Standard Poodles and yellow Labrador Retrievers. Our personal dogs “Do Stuff” and have titles as proof of that; we participate in conformation shows and Hunter Retriever events. We love our breeds and on occasion have litters of puppies available. These litters are bred for intelligence, health, and beauty. Puppies are raised in our home alongside our family; socialized with children and other pets. Our adults are health tested and come from great lines (we tend to stick with our lines because we believe in them). They all have impressive pedigrees. We do not have any breeding Labs at this time.